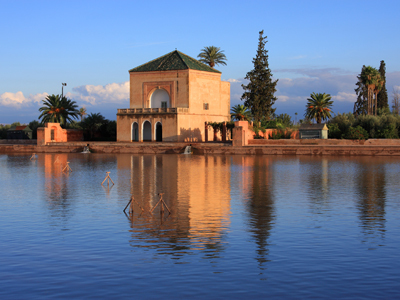 The western part of Morocco is a beautiful, leisurely tour through Islamic and Berber culture. 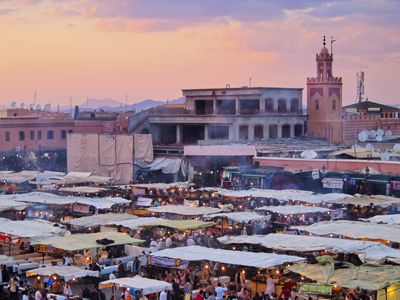 From Marrakesh to the Atlas Mountains, learn about the differences and similarities between these two cohabiting peoples. 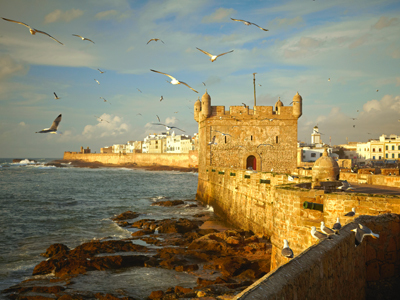 End your time in Essaouira, a beautiful surf town with excellent beaches and unforgettable sea food. 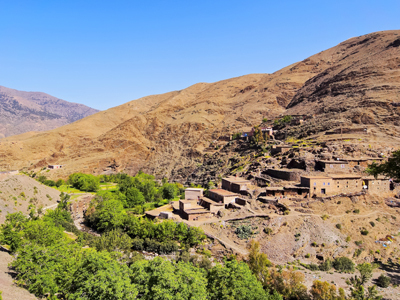 Today, you'll be picked up at your riad and taken to the High Atlas Mountains via Al Haouz plain, Tahnaout, Moulay Brahim gorges & Asni, continue to Ijoukak through Ouirgane & its lake, continue the drive on Nfiss Valley with a visit to the Tin Mil Mosque, lunch at the Berber village and then drive to Imlil valley, check in at Riad Jnane Imlil, dinner will be served at the riad. Northern Africa's highest mountain range has given birth to unique cultures ever since humans first began exploring its mountain passes. The high peaks completely stop the dry Sahara winds from the south, allowing for the comfortable Mediterranean weather that most Moroccan cities enjoy. Berbers call this place home, and it really takes a local guide to know where the semi-nomadic people are at any given point throughout the year. During the warm months of June through September, this is a hiker's paradise, while snow in the high peaks from September to May, transform the area into a sought after skiing destination . Leave the High Atlas today and head to the most laid back beach town in Morocco, if not in all of Africa. Don't let the wind bother you too much as this is Africa's wind capital as well. Surfers come from all over the world to ride the wind and water here. If the wind has died down, then the sun shines brightly. 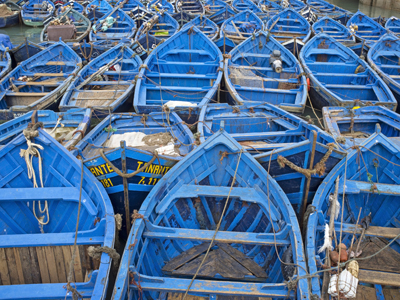 A medieval city, complete with fortified walls around a protected harbor, Essaouira shows European influence from the outside, but becomes distinctly Moroccan once you walk through its streets. The scents and smells of a fishing economy mix interestingly with regional spices, family riads and ubiquitous storefronts. Surfers come from all around the world to take advantage of the city's infamous, constant winds. 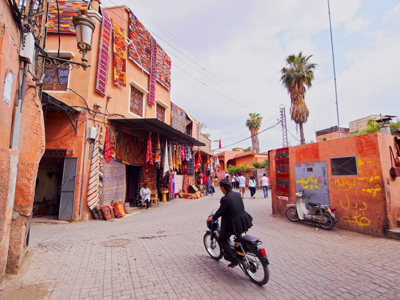 This morning you can do any last minute shopping or sightseeing before heading to Marrakesh. Riad Snan 13 is a relaxing retreat, where charm and essence provide a unique escape from the hustle and bustle of the city. This intimate property boasts only one grand suite and five double bedrooms, for a more personalized and unique accommodation experience. Each of the guest rooms feature their own style and special character, decorated with exceptional attention to detail. On property, you will also find a lovely outdoor patio area, swimming pool, dining area and two lounge areas, where you can relax and enjoy panoramic views from the terrace. 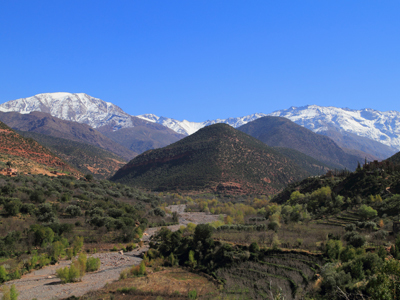 Riad Jnane Imlil is an authentic family-run guesthouse at the foothill of Mount Toubkal in the High Atlas Mountains. The property features nine rooms with private bathrooms, including four suites with balconies and three deluxe suites with sitting areas. The rooms were specially designed in traditional Berber style, decorated with impressive Moroccan architecture by local craftsmen. Three salons and two panoramic rooftop terraces feature gorgeous views of the Berber Villages & Atlas Mountains, including a postcard perfect view of the highest peak in Northern Africa, the Toubkal Summit. During your stay, you can expect comfort, tranquility, modern conveniences and high quality service. The Chbanate Riad provides an authentic Morrocan experience in the enchanting city of Essaouira. It strikes the perfect balance between traditional and modern elements. Set on the city wall, this beautiful riad offers a rooftop terrace overlooking the old medina of Essaouira. Its spacious guest rooms are elegantly decorated with Moroccan design and a fireplace. All of the air-conditioned rooms at the Riad Chbanate are also equipped with a TV and a luxurious bathroom with bathtub. They all overlook the riad’s indoor patio. There is also a hammam on site, and massages are available.